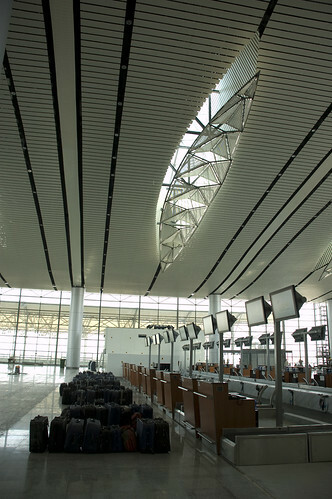 The new airport is one huge thing and unlike anything you would have ever seen in India. The current structure is supposed to be designed to handle 12 million passengers a year (current Hyderabad traffic is around 7 million passengers). When the whole airport is completely built it would be able to handle 40 million passengers a year, but that’s still quite a few years away. They’ve built loads of check in counters and huge baggage claim areas, so I guess long queues should be a thing of the past. The only problem is the distance of the airport from the city. Currently it’ll take about 1 to 1.5 hours from Banjara Hills to reach the airport. The expressway is going to take ages to be ready. So if you’re planning day-trips to Hyderabad, think twice! !